Written between the 4th and 15th centuries by spiritual masters of the Orthodox Christian tradition, the texts published in 1782 as The Philokalia were later translated into Slavonic and then Russian. This is the last of four volumes of a translation intended for devout religious readers. - Publisher Written between the 4th and 15th centuries by spiritual masters of the Orthodox Christian tradition, the texts published in 1782 as The Philokalia were later translated into Slavonic and then Russian. This final volume contains works by spiritual masters such as St Symeon the New Theologian (949-1022), Nikitas Stithatos (11th century), Theoliptos, Metropolitan of Philadelphia (c1250-1322), Nikiphoros the Monk (second half of the 13th century), St Gregory of Sinai (c1265-1346) and St Gregory Palamas (1296-1359). 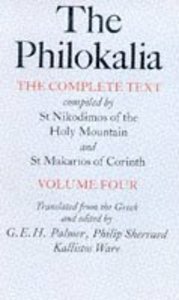 Written between the 4th and 15th centuries by spiritual masters of the Orthodox Christian tradition, the texts published in 1782 as The Philokalia were later translated into Slavonic and then Russian. This final volume contains works by spiritual masters such as St Symeon the New Theologian (949-1022), Nikitas Stithatos (11th century), Theoliptos, Metropolitan of Philadelphia (c1250-1322), Nikiphoros the Monk (second half of the 13th century), St Gregory of Sinai (c1265-1346) and St Gregory Palamas (1296-1359).